Little Spinners is an easy patchwork baby quilt pattern. Brightly colored pinwheel-like shapes rest against a white background fabric. Secondary white pinwheels emerge between the blocks. 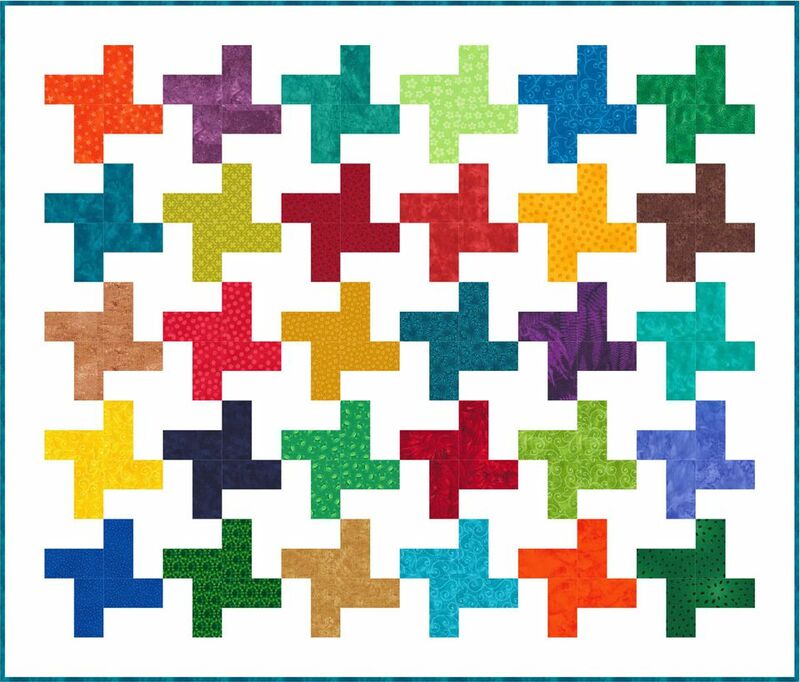 Change the color layout in any way you wish, and sew more of these easy 6-inch quilt blocks to expand the quilt's size. Each block in my example is made with a different bright fabric. Repeat fabrics as many times as you like―sew a color controlled quilt or go completely scrappy. A 2-inch wide white border surrounds the quilts and blends with the background of blocks to make them appear to 'float.' The quilt's edge is finished with a brightly colored quarter inch binding. The blocks are strip pieced, and suitable for all quilters―give this baby quilt pattern a try even if it's your very first quilt. The quilt finishes at about 34-1/2" x 40-1/2". Instructions help you either sew a scrap quilt with unique brights or repeat fabrics. To begin, cut just enough fabric for a sample block. About 175 continuous inches of doublefold binding. Sew with a 1/4" seam allowance. Cutting and yardages are for 6" finished quilt blocks, but blocks can easily be converted to an 8" finished size by sewing with jelly roll strips. Make strip sets for one block from a 2-1/2" x 18-1/2 white strip paired with a 2-1/2" wide jelly roll strip of the same size. Cut (4) 4-1/2" segments for one block and follow the instructions on page 2 for block assembly. Cut (8) 2" wide strips of white fabric from selvage to selvage. Cut white strips to match the length of your brightly colored strips. Choose a bright strip and pair it with a white strip of the same size. Sew the two together lengthwise with a quarter inch seam allowance. Press to set the seam. Carefully press the seam allowance towards the darker strip. Square up one end of the strip set. Beginning at the squared up end, cut as many 3-1/2" segments as possible, top illustration (the count will vary depending on which strip length you chose on page 1). Grab four segments and arrange them into two rows of two segments each as shown, bottom left. Sew the segments in each row together. Press seam allowances towards the vertical strips. Join the rows. Press the connecting seam allowance now (either way) or wait until you have established a layout and then press the allowance in adjoining blocks in opposite directions. Repeat to make a total of 30 quilt blocks. If you chose to sew with shorter strip sets, you will need to cut a few extra strips to compensate for the length required for squaring up. Use a design wall or other flat surface to arrange the 30 quilt blocks into six rows, each row with five blocks (the illustration on page 1 has been turned on its side, so it is six blocks across and five down -- the same layout). View the quilt from a distance. Do you like the color arrangement, or should some blocks be moved around? Rearrange the blocks as desired and check again. Leave the room for a while. Do you still like the layout when you return? Shift blocks around until you're happy with the appearance. Sew blocks in each row together. Press seam allowances in adjoining rows in opposite directions and then join the rows. Press the quilt top. Cut (4) 2-1/2" x selvage width strips for the borders. Use our quilt border instructions to measure correct border lengths, beginning with the two borders on the longest edge so that each can be cut from a single strip of fabric. Align and sew borders to the two long edges as explained. Repeat to create and sew borders to the shorter edges. Mark the quilt for quilting if necessary. Sandwich the quilt top with batting and backing and baste. Quilt the quilt. Remove excess batting backing, squaring up the outer edges of the quilt carefully if necessary. Sew easy mitered binding around the edges of the quilt.